Norway is the best performing advanced economy in 2018, with a consistently strong performance: it ranks second on one of the Index’s three pillars (Intergenerational Equity and Sustainability) and third on each of the other two (Growth and Development, and Inclusion). Small European economies dominate the Index, with Australia (9) the only non-European economy in the top 10. Of the G7 economies, Germany (12) is ranked highest, followed by Canada (17), France (18), United Kingdom (21), United States (23), Japan (24), and Italy (27). In many countries, there is a stark difference between individual pillars: for example, the US ranks 10th out of the 29 advanced economies on Growth and Development, but 26th on Intergenerational Equity and Sustainability and 28th on Inclusion; France, meanwhile, ranks 13th on Inclusion, 21st on Growth and Development, and 24th on Intergenerational Equity and Sustainability. Low scores on the latter pillars suggest an economy may be storing up problems for the future. In the ranking of emerging economies, six European economies are among the top 10: Lithuania (1), Hungary (2), Latvia (4), Poland (5), Croatia (7), and Romania (10). 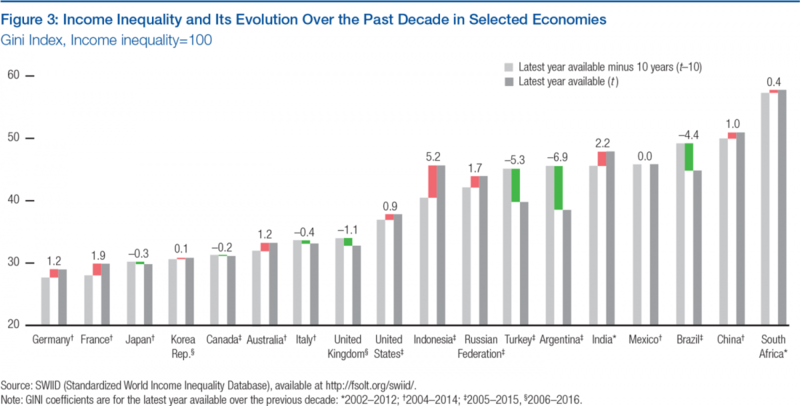 These economies perform particularly well on Growth and Development, benefiting from EU membership, and Inclusion, with rising median living standards and declining wealth inequality. Latin America accounts for three top 10 economies: Panama (6), Uruguay (8), and Chile (9). Performance is mixed among BRICS economies: the Russian Federation (19) is ahead of China (26), Brazil (37), India (62), and South Africa (69). Although China has ranked first among emerging economies in GDP per capita growth (6.8%) and labor productivity growth (6.7%) since 2012, its overall score is brought down by lackluster performance on Inclusion. Turkey (16), Mexico (24), Indonesia (36), and the Philippines (38) are among economies which show potential on Intergenerational Equity and Sustainability, but lack progress on Inclusion indicators such as income and wealth inequality. As for recent performance, 64% of the 103 economies for which data are available have seen their IDI scores improve over the past five years, attesting to recent efforts by policymakers to broaden socioeconomic progress. 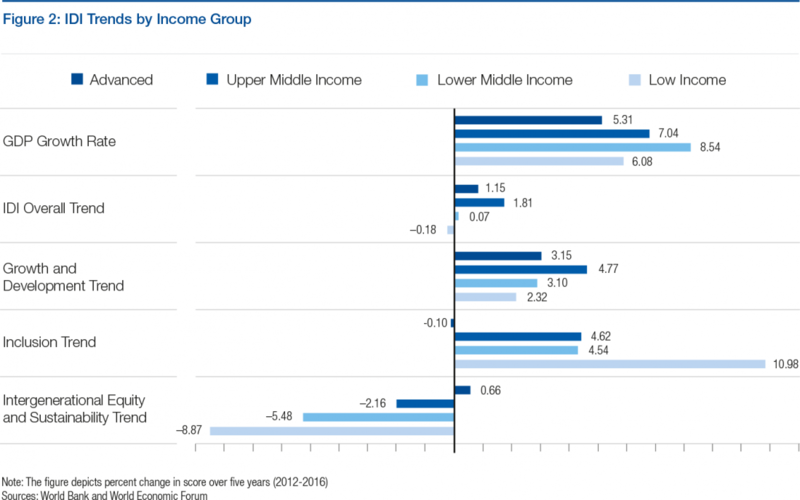 This has been largely driven by gains among upper-middle-income economies, while low-income economies have fallen further behind (Figure 2). In 27% of the economies, however, IDI scores have decreased even as GDP per capita has increased. Tables 2 and 3 depict examples of economies that have done particularly well at making their growth processes more inclusive and sustainable: Czech Republic, Iceland, New Zealand, Nicaragua, Rwanda, South Korea, and Vietnam. Other economies have significantly lower IDI rankings than GDP per capita rankings, indicating that their growth has not translated well into social inclusion; these include Brazil, Japan, Nigeria, South Africa, and the United States. (Iceland, Israel, and Korea). Four countries have been no better than mediocre (Czech Republic, Estonia, Japan, and the United Kingdom) and four perform poorly on Inclusion measures (Ireland, New Zealand, Slovak Republic, and the United States). [/fn] A majority, 16 of 29,3 have seen Inclusion deteriorate, and the remaining three have remained stable.4 This pattern is repeated in the relationship between performance on GDP growth and the Intergenerational Equity and Sustainability pillar. Part of the reason for the weak recent performance of advanced economies on Inclusion has been the rather anemic pace of economic growth during this period. If growth had been significantly faster, there might have been stronger improvement in other areas of the Index. But this possible explanation is undercut by the fact that a majority of economies with the best GDP growth performance (the top two quintiles) have failed to improve on Inclusion. This analysis suggests that GDP growth is a necessary but not sufficient condition for achieving the broad-based progress in living standards on which polities ultimately judge their countries’ economic success. This message is particularly important to bear in mind at a time when global economic growth is finally rebounding to a more robust level. Policymakers should not expect higher growth to be a panacea for the social frustrations that have roiled the politics of many countries in recent years. 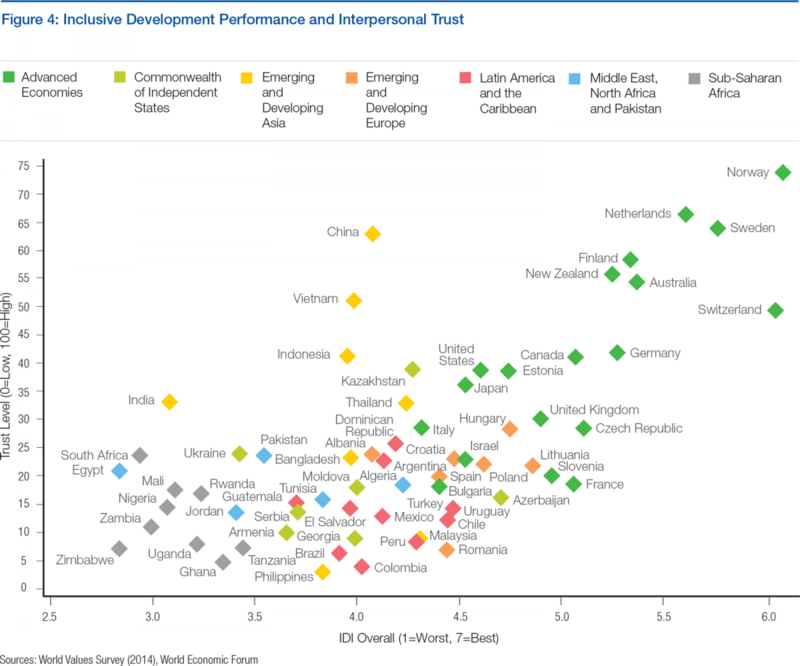 Indeed, inclusive economic progress is correlated with higher levels of interpersonal trust (Figure 4); economies where survey respondents agree that “most people can be trusted” tend also to perform well on the IDI. This points to the need for a more human-centric approach to improving the cohesion of increasingly fractured societies. Nonetheless, several Asian economies show it is possible to maintain high levels of trust despite only average levels of inclusive development. between low- and high-income individuals. The United States, for example, ranks the second lowest among advanced economies on inequality-adjusted life expectancy although it boasts the 9th highest GDP per capita. 3 Finland, Germany, Greece, Ireland, Italy, Luxembourg, Netherlands, New Zealand, Norway, Portugal, Slovak Republic, Slovenia, Spain, Sweden, United Kingdom, and United States have seen Inclusion deteriorate. 4 Austria, Estonia, and France have seen Inclusion remain stable. 5 Armenia, Dominican Republic, Georgia, Mongolia, Paraguay, and Tajikistan score in the top two quintiles on at least three of four Inclusion measures; Bangladesh, China, Ghana, Indonesia, Latvia, Lithuania, Moldova, Nicaragua, Panama, Sierra Leone, Turkey, Thailand, and Vietnam score in the top two quintiles in at least two Inclusion measures; Bolivia, India, Lao PDR, Malaysia, Peru, the Philippines, Romania, Rwanda, Sri Lanka, and Tanzania score in the top two quintiles on one or fewer Inclusion measures.